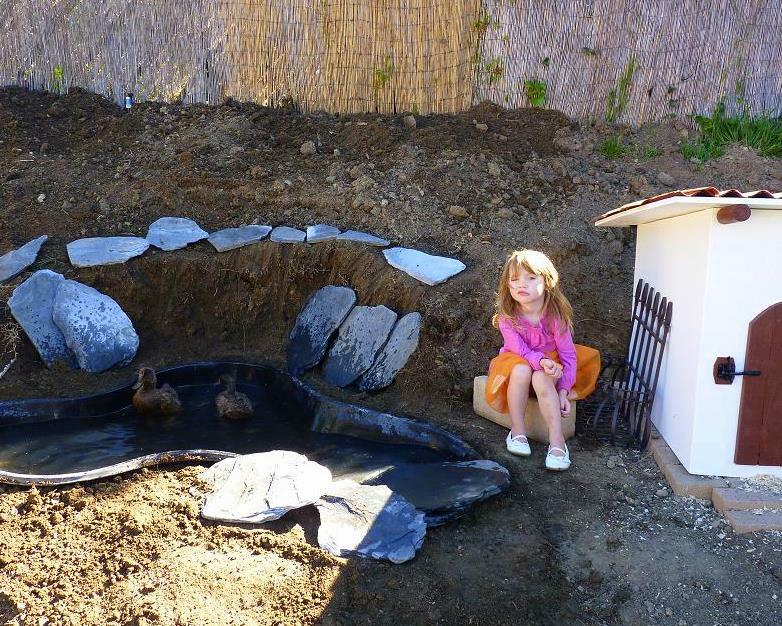 ﻿Our Campbell Khaki ducks, Lotta and Big, have a beautiful spanish duck-mansion with an adjacent splashy pool which they just love. 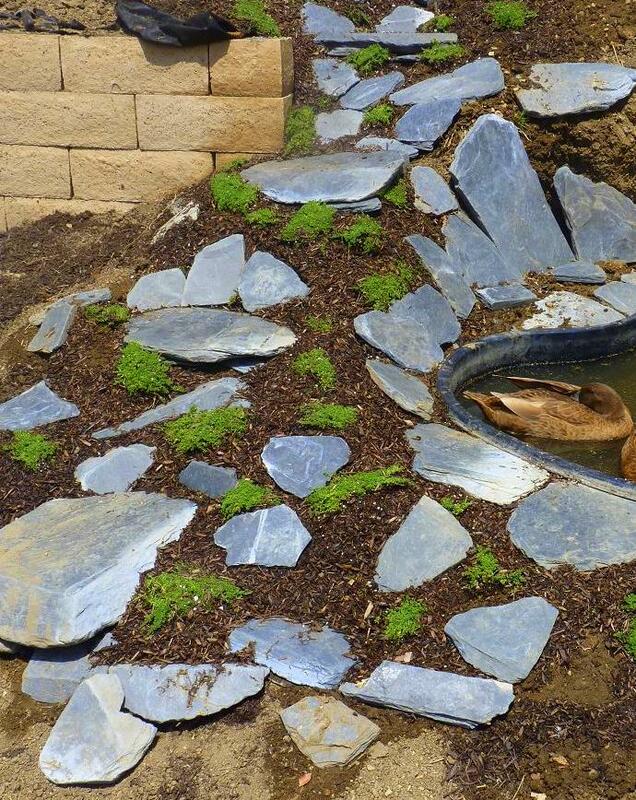 However, I felt that their landscaping could use some upgrading while at the same time we needed some stairs to be able to get to the flower beds above the pond. What I had to work with was a pretty steep slope, lots of these stones and obviously the pond. What I wanted was stairs, some edible plants or flowers and a tad more 'pretty' overall. With a pick, I created stairs and layed the stones so one can step upon; took all morning. 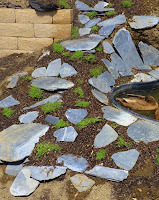 To ensure the stairs will hold up and the slope won't mud-slide back down, I figured it might be a good idea to plant some sort of a ground cover, as to create some sort of a root-web that holds everything in place. So, I went to the Do-It-Centre. What I was looking for was something drought-resistant, edible (for humans), harmless to ducks and chickens and a perennial (no re-seeding or re-planting!). I somehow already had creeping thyme in mind but was open to other suggestions. Unfortunately the gardener was not too knowledgeable about ground covers and the lady at the cashiers desk even commented on that. She then suggested going to Armstrongs down the street. Love when people are actually helpful as opposed to pushing you to buy their stuff that won't work and therefore won't make you happy. "Get what you want! ", as Roberto always says. These folks really know what they are doing. Got great assistance and YES: Creeping thyme is the way to go; don't you love when your gut is leading you!? It is a perennial, a very aromatic herb that I can use in the kitchen, it's a pollinator attractor (pretty little pinkish flowers) and should not harm anyone. So I got a flat of creeping thyme (ground covers are typically sold in flats) and then back at home I planted it. BTW: After the drive home, my car smells nice now! ﻿To plant from out of a flat is kinda weired, because you simply pull the poor plant-thing in pieces. Yes, you may lose some roots! I made mainly triangular or odd shapes. It is advisable to - while waiting for them to get established -water them more often. Once they have taken, they are pretty drought resistant. Creeping thyme is best planted in the ground; in a container, it is not happy - guess it wants to creep around. And these ducks are munching it. ARGH! Let's see how long this pretty sight lasts.